THE GREATEST SONGS OF THE EIGHTIES uncovers a bounty of treasures and reignites nostalgia for these fantastic hit songs reinterpreted by Manilow in his signature style – from his duet with Reba McEntire on “Islands in the Stream,” as they pay homage to Kenny Rogers & Dolly Parton’s #1 duet of 1983 – to a trio of songs associated with memorable films: Phil Collins #1 hit of 1984, “Against All Odds (Take A Look At Me Now)”; Bill Medley & Jennifer Warnes’ #1 hit of 1987, “I’ve Had the Time of My Life” (from Dirty Dancing); and Christopher Cross’ Oscar-winning #1 hit of 1981, “Arthur’s Theme (The Best That You Can Do), ” and much more. 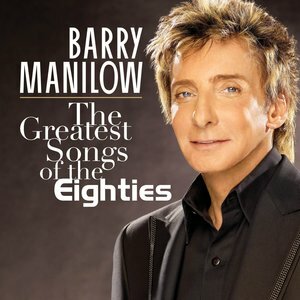 THE GREATEST SONGS OF THE EIGHTIES is Manilow’s newest addition to the mega-best-selling series of tribute albums that he masterminded with Arista founder Clive Davis. Davis has been Manilow’s hitmaking collaborator on virtually all his recordings, since they first worked together on “Mandy,” his debut #1 single as the first artist signed to Arista by Davis in 1974, the first year of the label’s existence. THE GREATEST SONGS OF THE EIGHTIES continues the series that began nearly three years ago with The Greatest Songs Of The Fifties, which was certified RIAA platinum after entering the Billboard 200 at #1 in January 2006 (his first #1 album since Barry Manilow/Live in 1977). The Greatest Songs Of The Sixties (October 2006) entered at #2. When the RIAA platinum The Greatest Songs Of The Seventies entered at #4 (September 2007), he was distinguished as the only artist to chart three Top 5 debuts during 2006-2007. THE GREATEST SONGS OF THE EIGHTIES moves seamlessly through a selection of major hits from both sides of the Atlantic. The UK is well-represented by “Careless Whisper,” the #1 hit of 1984 by Wham! featuring George Michael; Rick Astley’s #1 “Never Gonna Give You Up”; and a song that Van Morrison first wrote and recorded in 1989, “Have I Told You Lately,” which later became a giant hit for Rod Stewart.